Study the following pie chart and table to answer these questions. 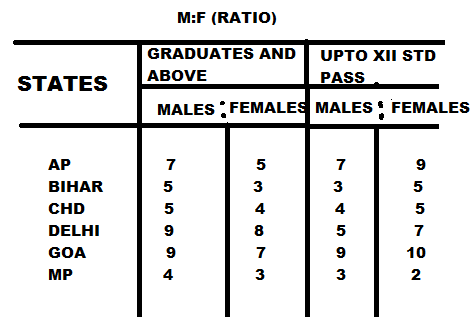 1) What is the difference between the graduate male population and XII Std male population from AP ? 2) What is the ratio of female population of Goa to XII Std female population of Delhi respectively? 3) Graduate female population of Chandigarh what per cent of the XII Std female population of the state ? 4) Class XII pass male population of Chandigarh is what per cent of the total XII Std population of all the states together ? 5) What is the ratio of graduation male population of the Goa to XII Std female population of that state ? 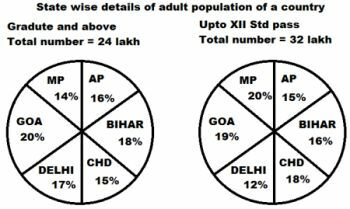 6) Total graduate population of state MP is what per cent of the total XII Std population of AP ? 7) XII Std male population of Goa is what per cent of XII Std male population of MP? 8) What is the ratio of the total graduate and XII Std male population of AP to the total graduate and XII Std of AP to the total graduate and XII Std female population of that state ? 9) What is the ratio of the total graduate population of the Delhi to the total Std population of that state?